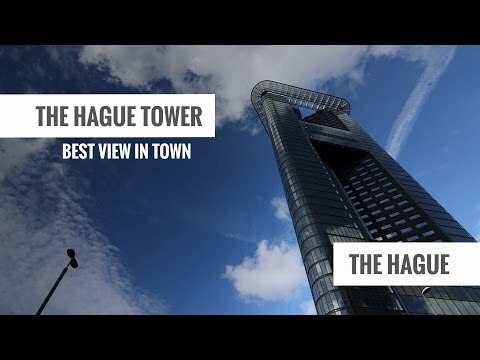 The Hague Tower, with 42 floors and 135 metres in height, is a striking appearance in the city centre of The Hague. Because of its triangular shape, the locals sometimes affectionately refer to the building as “The Clothes Iron”; the tower is inspired by the famous Flatiron building in New York. In the skyscraper you will find The Penthouse restaurant, a Sky Bar, apartments and exclusive Business Suites. From the upper floors you can enjoy breathtaking views up to 45 kilometres away: the skyline of The Hague, Scheveningen, Delft, Rotterdam and Leiden. The Hague Tower is open daily until late at night. For a few euros the glass panorama lift will take you to the top of the building. A drink is included. With a lunch or dinner reservation for The Penthouse, the entrance is always free. 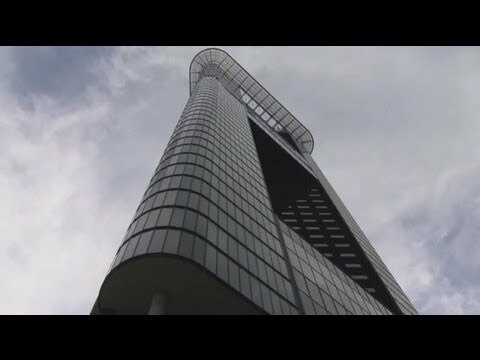 The top floor of The Hague Tower is home to the highest restaurant in the Netherlands. It is higher than the Eiffel Tower restaurant! The Penthouse offers a breathtaking view, but the exclusive dishes and the warm interior design also make this restaurant one of the most special places in the Netherlands. The kitchen, led by Chef Brian Whyte, literally creates high-level cuisine. The restaurant is widely praised in guest reviews. Besides a luxury dinner, this is also the place to enjoy a lunch, very high tea or cocktail moment. Remember to visit the spectacular city balcony and enjoy the amazing view! Concerts and parties regularly take place here when The Penthouse transforms into a nightclub. Then you will also see a unique gimmick: with a single press of a button the view can be changed in the evening into a video projection on glass. Late at night as a tool for video artists, but also perfect for special business presentations. The Penthouse is open every day from lunchtime until late. On the 40th floor is the Sky bar, newly opened in 2018. It serves drinks ranging from old classics like the mojito or the cosmopolitan to our own Penthouse cocktails. For guests who get stressed out about the choice: tell us what flavours you love and let the bartender improvise and surprise you. In addition to an extensive range of cocktails, you can enjoy a culinary journey around the world in the Sky Bar with various internationally inspired bites. De Sky Bar is open mon - friday 17:00 - 00:00 uur, saterday and sunday 12:00 - 00:00. In addition, there are four exclusive suites on the 40th floor. They can be combined to create a ballroom. This is a very special location for meetings, gatherings or for example a private or wedding dinner, both for companies and private individuals. Accommodates from 2 to 250 people. Don’t feel like going home? Then book a special top-floor overnight stay! The 29th, 30th, 38th and 39th floor of The Hague Tower has several apartments available for overnight stays, from one night to several weeks or months. The apartments can be rented on The Penthouse website. The small triangular footprint of The Hague Tower is inspired by the Flat Iron Building (1902) in New York. Architect Paul Bontenbal of AAArchitecten saw the potential of this place right next to The Hague’s Hollands Spoor railway station and initiated construction. The tower undeniably occupies a prominent position on the Rijswijkseplein and due to its slenderness, partly owing to the height of 135 metres, contributes to making the large urban space in the square more attractive. Located between the public spaces on the top and the ground floor are living units that vary in size from 36 m² to 144 m². Halfway between the two wings of the tower is a huge conservatory with a gym. The Hague Tower was completed in 2007 when it won the new City Prize awarded by the municipality of The Hague and the prestigious Emporis Skyscraper Award. In 2017 The Penthouse won the Silver Stork, the prize for exceptional entrepreneurship in The Hague.